To celebrate the release by MLR Press of my second novel, I’m giving away 10 copies (ebooks) through an 11-stop blog hop. To enter, comment before midnight, October 25, 2013 on any of my posts on the eleven participating blogs. Be sure to include an email address. After Christmas Eve is set in a time and place I’ve never experienced. Except for Philip, a supporting character in Until Thanksgiving and the protagonist in this novel, nothing is familiar to me. The settings exist only in my imagination. Without any superficial contact to the story, I reached deep inside and tapped into things I know in my gut. Writing fiction gives me the freedom to embellish the hell out of the truth. I have fun adorning reality with extra details, semi-truths, and pure fabrications to suit my own purposes. Nobody—or very few anyway—knows what parts really happened and which are just made up. The stories in my novels aren’t true. They’re made up. But I write what I know. Reality creeps into the story in interesting and unexpected ways. I don’t write fantasy. I write reality-based stories—fiction that’s true enough for government work. 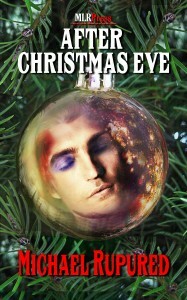 *This is the ninth of eleven stops on the After Christmas Eve Blog Hop. Excerpts appear in serial form along the hop, beginning with my post at Shira Anthony’s. Philip glanced at his watch and wondered where the time had gone. After dropping the radios off at the shelter, he’d popped into the toy department at the Sears & Roebuck store to see about last minute gifts for Thad. Checking out took longer than he’d expected, but he didn’t want to be rude to the helpful clerk. The glares of the shoppers who waited behind him had no impact on his holiday spirit. As snow crunched beneath his black rubbers, Philip contemplated what awaited him at home. James was… excitable. No matter how his father had responded, his lover’s reaction would be extreme. If the old man had written James a check, he’d be dancing on the ceiling. If not, well… if not, then Philip would do what he could to cheer him up. From the day they’d met, Philip had been driven by a desire to guide and protect this rare and beautiful gift to the human race. How someone could cast such an exquisite creature into the streets baffled him. That the boy’s father had been the one to commit such a heinous and disloyal act infuriated him. Philip had been only nine when his own dad had died. He didn’t have many memories of him, but those he had were wonderful—so much so that he wasn’t sure which were real and which were only figments of his imagination. Besides his dancing ability, James had a superlative gift for embellishment and a raw talent for making ordinary events sound either much better or worse than they were. Although entertaining at parties, living with the drama was sometimes a challenge. Philip knew tomorrow would either be the absolute best Christmas James had ever had…or the worst. If only he could influence the outcome. Knowing it all came down to James’s father—a man not known for doing the right thing—made Philip uneasy. Streets that had overflowed with traffic and last-minute shoppers earlier were now almost deserted. Progress was slow, thanks to the packed snow that covered the sidewalks. Whether James was jubilant or sorrowful, Philip didn’t want him to be alone on Christmas Eve any longer than he had to be. Solitude and James didn’t mix well. When Philip got to the apartment, he’d listen to what James had to say about the meeting with his father. He suspected he already knew, but pushed the thought from his mind, hoping he hadn’t nurtured it into being. Think positive. Due to an error on my part, the previous post was delayed until today. Sorry for the confusion for everyone following along! Was almost afraid to read todays installment after number 8 – keep thinking positive Philip! That’s Philip for you…always positive. My heart ached reading this. If only James could see himself as the “rare and beautiful gift to the human race” that Philip sees. I think reading about Philip’s reaction to what happened will be even more painful than the one I had to James’ actions. If only that was all Philip had waiting for him at home…. I almost don’t want Philip to make it home. This is going to be hard to watch….